Intelligent Compact Industrial 3G/4G M2M Serial Modem, last gasp option, watchdog, Java inside. Especially used in Electricity Smart Metering. Suitable Telstra 4GX, Optus 4G Plus, Vodafone 4G+, Spark NZ, and 2degrees networks. The ETM Purple2 product family is a range of LTE and UMTS wireless modems is designed for use with a variety of serial devices, including energy meters, in order to provide a robust communication channel to back ofﬁce systems. The ETM Purple modem is compact, has a wide operating temperature range, and can be enabled with intelligent features making it an ideal choice for demanding applications. 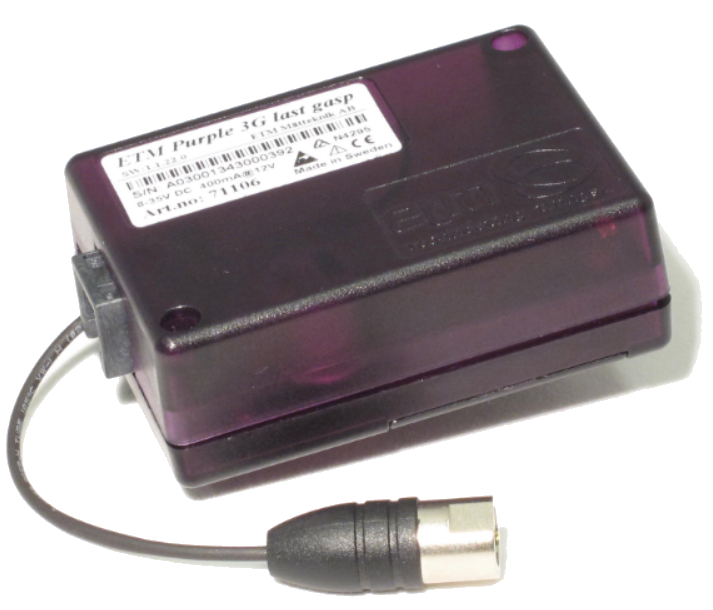 The ETM-Purple are 3G/2G or 4G/3G serial modems that can be made available with ”last gasp” to provide power failure alarms by utilizing super capacitors. In addition to standard AT interface the terminals can run JET code to provide TCP Tunnel, Serial to Server and other operational modes that allow easy deployment of IP connectivity to serial devices. Finally, the modems have the ability to send status data to a server, such as ETM’s EWO system to allow WEB based monitoring of unit status.